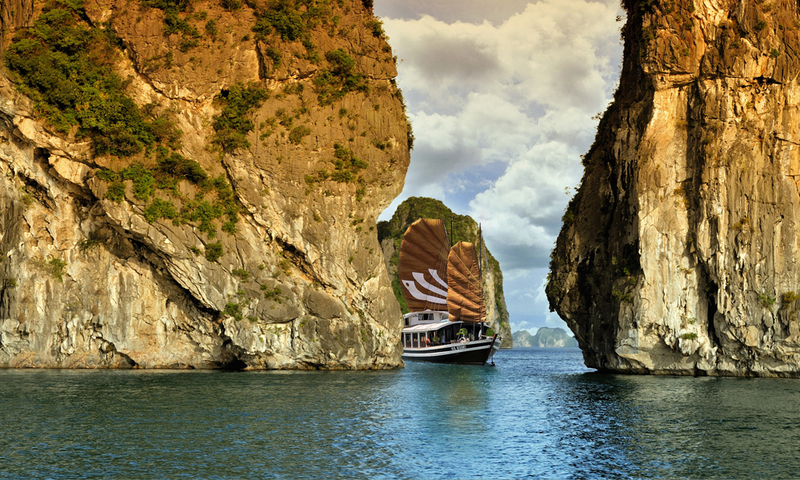 Dedicated to people who want to explore every corner of Halong Bay! What is the first thing that come to your mind when you’re thinking about Halong Bay? If you’re thinking about one of these things above, you are missing out a very important feature – the islets of Halong bay! 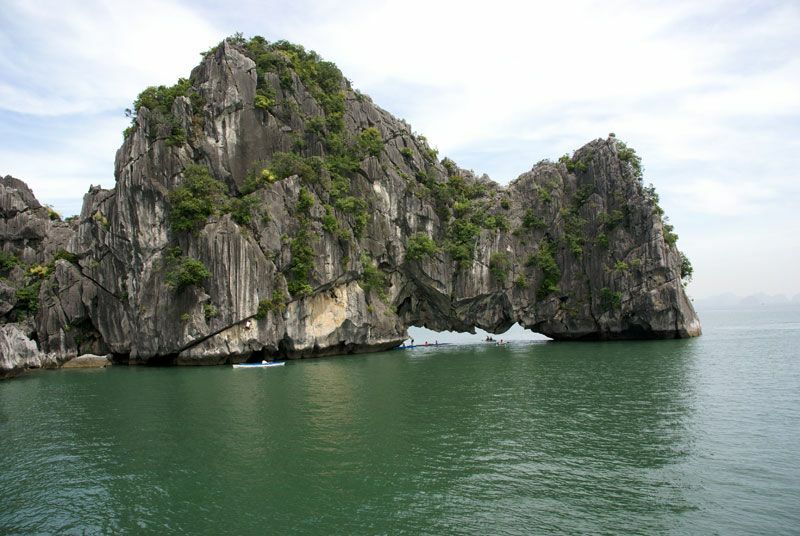 Today, we are going to have a look at the system of islets in Halong Bay! Dinh Huong islet was also known with another name Lu Huong islet. Located in the southwest of Dau Go cave and nearby a big floating village area, tourist will catch a huge stone standing on 2 tiny legs. Dinh Huong Islet looks like a Incense Burner when the tide is low. At that time, you will clearly see its 4 legs underneath. The image of Dinh Huong islet was printed on 200,000 vnd bill resembling the thankfulness for national heroes. Dau Nguoi islet looks like a Human Head Shape from afar. It situated in the south of Bo Hon Island and away about 13 km from Bai Chay Wharf. It is also nearby some famous attractions such as Luon Cave, Sung Sot cave and Ti Top island. Dau Nguoi Islet is about 25 meters high. The most ideal time to gaze the islet is at the sunset. By kayaking or from the cruise, tourists will see fantastic scenery of Dau Nguoi Islet in red sunshine of late afternoon. Con Coc islet is located in the southeast of Halong Bay and away 12 km from Bai Chay Wharf. The islet looks like a big toad which is waiting for the rain at the middle of the sea from afar. The legend said that when the toad grinds its teeth together, it’s rain immediately. The grind of the toad has become a sign of rain and helps Vietnamese farmers forecast the weather in agriculture. Ga Choi islet is also called Trong Mai islet. The islet looks like a hen and a rooster facing together and raising from the sea. As the story told by the locals, Ga Choi Islet represents for the faithfulness of love. 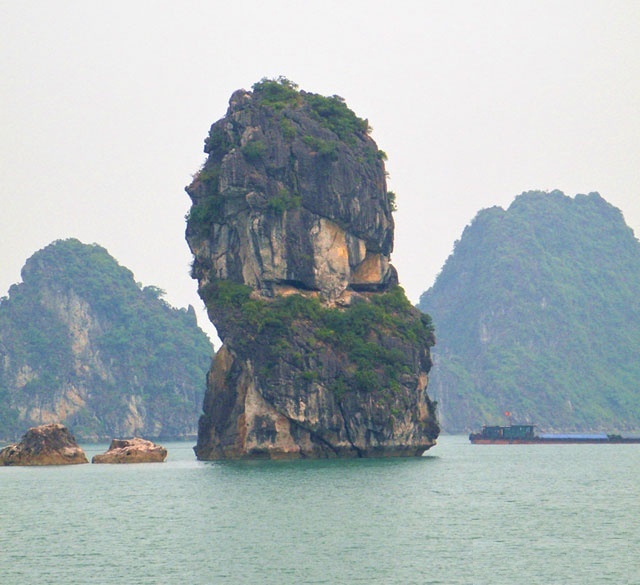 Ga Choi Islet is located at the southwestern Halong Bay, about 5 kilometers from Bai Chay wharf. The islet is about 10 meters high above the sea level. Cho Da Islet, also known as Stone Dog Islet, is near Dau Go Cave on the west. The islet is in the shape of a dog sitting with its back to the sea, standing guard for the safety of seagoing boats for millions of years. Cho Da Islet lies in the middle of the sea as a holy object to worship the Sky and Earth. Halong tourism will surely not be complete if tourists do not ascertain about Cho Da Islet. But Islet is close to Cat Ba Island, on the way to the Ba Trái Ðào Island, Halong Bay. After 30-minute boating away from the Con Coc Islet, you can visit the islet. But Islet looks like a pen bobbing from a far view and it also has a small beach that tourists can anchor here to swim. 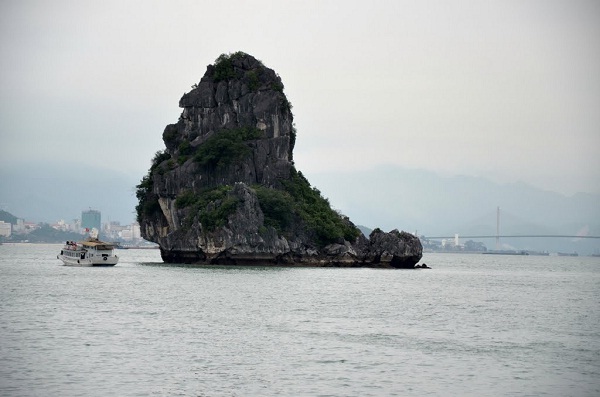 Thien Nga Islet (Swan Islet) is a stone island situated on Bai Tu Long Bay, right next to Cong Tay Island. Thien Nga Islet is about 15 meters high above the sea level. The islet includes three stones piling on each others. The largest block forms a swan body and the two left shapes a head and neck of the swan. The perfect combination of blocks creates a great sculpture sharing the shape with a swan. Mat Quy Islet (Monster Face Islet) is located in the territory of Bai Tu Long Bay, nearby Am Islet. Mat Quy Islet is about 30-35 meters above the sea level. Looking from a far, it’s easy to imagine the islet is a head of a monster. The monster head has a big nose on a distorted face. The legend said that this islet is the head of an angry monster that the Turtle King killed long time ago. Mat Quy islet is interested by both international and domestic tourists visiting Halong bay. 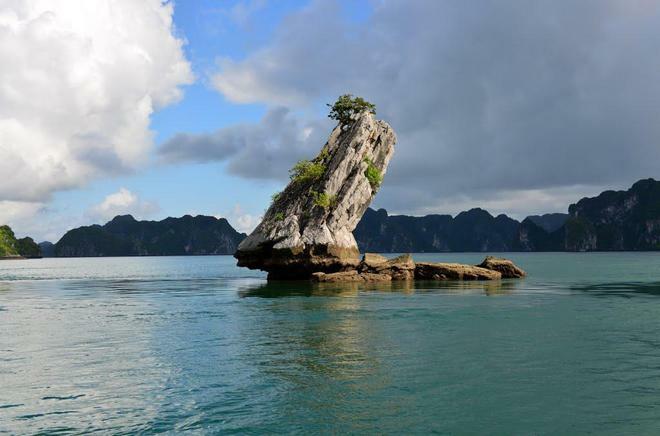 Yen Ngua Islet (Saddle Islet) is situated in the center of World Heritage Area of Halong Bay. It’s famous for the unique shape of a huge saddle rising from the sea. The islet was formed by two stones: one is higher than the other and one is lower. The two stones are linked with each other and look like a saddle from a far distance. Yen Ngua islet is one of interesting sites on Halong bay that usually involved in cruising track of tourists when visiting Halong. Yes, this is the end of the post. 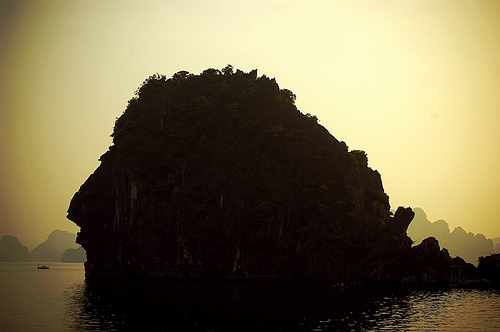 We hope you will be inspired after reading the list of the most beautiful islets of Halong Bay. What do you think about this post, leave a comment below. To get the latest post, share and follow our blog. For more interesting tours in Vietnam, please check our website at trulyvietnamtour.com!